The place Mannachanallur is about twelve kilometers from Trichy. Local buses are available to this place from chatram bus stand, Trichy. You will be seeing some excellent landscapes while on your way to this kshetra from Trichy. The place itself is a very busy town with lots of activity. This town is the base for trading many agriculture products. Basically all the agricultural products that are produced from nearby villages are brought here since this place is a centre for trading. The trading of these commodities is the main business activity here. There are many oil mills in this town. The Chettiyars who are basically traders by nature buy rice and pulses from here. They had strong presence here from early days. This trading community had established a wide network of business contacts throughout south. Nayaks, Nawabs of Karnataka, French, and British fought many wars for supremacy of the nearby area like Samayapuram, Trichy etc. This had influenced the traders to make their contacts wide. As you enter the town you will be welcomed by Sri Bhoominather temple. The legend as why this town is called Mannachanallur is linked to this temple. While there are many other temples here, it is worth mentioning that there are two temples for Lord Anjaneya [Hanuman]. While the first one is in the main road near Vaaniyar Sangam, the other one is in Mela Agraharam. Before we proceed to know about the ancient Hanuman temple let us see the legend as to how this place got the name Mannachanallur. Andhakan was a powerful demon [asura] and was frightening Devas and others. Devas prayed to Lord Siva to get rid of the demon. Lord Siva on the request of Devas vanquished Andhakasura. When the demon was killed, a drop of sweat fell on the battle ground from the forehead of Lord Siva. That drop had turned into a demon, and started eating everything it could find in the battle field. The hunger of the demon was not fulfilled by these. It prayed to the Lord Siva, since the Lord had created him, he is duty bound to feed him. Saying so, the hungry demon started eating the earth. Seeing this, all the Devas together had pinned the demon to the ground and did not allow it to getup. The demon started complaining that he is hungry and asked them to feed him. The Devas replied to the demon that he will remain pined to the ground by the force of forty-five Devas always. But during certain days and on particular time he will be freed for one Nazikai [24 minutes] to seek his food. Devas further said that people who are constructing new house on the ground would offer food during this time and as a reciprocation he will protect/guard the building from all evil forces. Any offering made in the yagnya without observing the prescribed rules will also serve as food for him. He will hence forth be known as “Vastu Purush”. The furious looking demon had thus become protector of ‘Bumi’- mann [மண்] in Tamil. The place where the demon was born had come to known as Mannachanallur [மண்ணச்சநல்லூர்] and the Lord Siva of this kshetra thus gets the name Bumi Nather. The trading community known as Vaaniyar of this town or more popularly Chettiyars is now maintaining an ancient temple built around three hundred and fifty years ago. This ancient temple for Lord Hanuman [Anjaneya] is named “Sri Sanjiviraya Perumal Temple” establishing the influence of Nayaks. The temple is in the heart of the town, and at a walkable distance from the Sri Bhuminathar temple. The temple built on a huge area has a big compound and the three tier gopuram [not too tall] with three kalasams welcomes you. This is one of few ancient temples exclusively built for Sri Hanuman which has Rajagopuram. [Iyen kulam Sanjivirayan of kanchipuram, Moolai Anjaneyer of Thanjavur are the other two which we have covered earlier]. The main arch in the entrance has Sri Rama seated along Sri Sitadevi and Sri Baratha, Sri Sathruguna standing beside the couple, Sri Anjaneya and Sri Lakshmana sitting near the Sri Rama Charanam. This assemblage is flanked by Sri Vibishana and Sri Sugriva on either side. Lord Hanuman of this kshetra is called Sri Sanjivirayan and the temple is known very uniquely as “Sri Sanjiviraya Perumal Temple”. Entering through the gopuram which is north facing one will step into the huge open prakaram of the temple. Entering from the gopuram one can see a stone piller. The stone pillar is encompassed by a huge hall with tile roof. The temple is built east-west and from the main hall and one could see the garbhagraham after the mun mandapam. At the western end of the main hall facing the Lord there is a Tulsi plant in a madam. The vimanam above the garbhagraham has Sri Garuda on all the four corners. Sri Vishnu with His concert Sri Sridevi and Sri Bhoodevi in seated posture is on three sides of the vimanam. The sixteen sided stone pillar in front of the garbhagraham presently looks as if it is the koti kambam. These stone pillars are a unique mark of the Nayaks period which could be seen in Ariyalur, Mannargudi, Kanchipuram, Vallam and Srirangam etc. It is told that there was a vigraha of Lord Anjaneya on the top of the pillar, which is now placed in the main garbhagraha of the temple. As you enter the mun mandapam from the main hall there is a stone with epigraph in the mandapam and the inscriptions on it dates back to the year 1704 and relates to this temple. This again establishes that this temple is ancient one. The unique stone pillar and the inscription put together establish that the temple is atleast around three hundred years old and was built during the period when this kshetra was under the influence of Nayaks of Vijayanagar patronage rule. 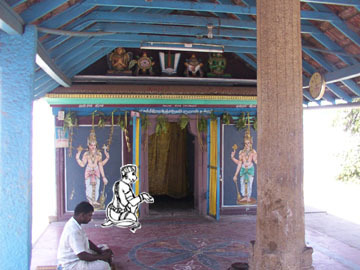 From the mun mandapam one can see the garbhagraham in which the following deities are installed: Sri Garudazwar, Sri Anjaneya [two in number], Navaneetha Krishnan, and a Nagar. 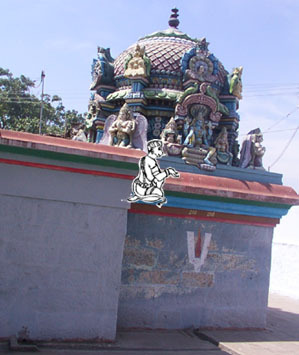 As stated earlier one of the Sri Anjaneya vigraha was installed on the top of the stone pillar. Poojas are conducted for all the deities. The utsava murti of Sri Sanjiviraya is also kept here. Lord Sri Sanjiviraya Perumal is about two and half feet in height. The Lord is seen in standing posture with ‘Anjali hastha’ [folded hands]. His tail is seen coiled and rolled down along his leg. The Lord is seen wearing ornaments in His ankle, leg, hand, wrist and neck. His eyes are bright and looking straight. The ‘diirga kataksham’ of Lord bestows all happiness to the devotee. The utsava murti of Sri Sanjiviraya in panchalooka was made in the year 1929. Kumbabishekam was done on 20.01.2002 and earlier to that it was on 14.09.1972. On every Saturday special ‘Tirumanjanam’ is performed. Sri Anjaneya Jayanthi is celebrated in great scale during Tamil month Margazi [Dec-Jan]. Sri Sanjiviraya is taken out on procession during Puratasi – Thiruvoonam. The temple provides the devotee a great atmosphere for meditation and to contemplate on Lord. Lord Sanjiviraya of this kshetra is sure to bestow all happiness to His devotees.